A confident Central Bank Governor Dr. Indrajit Coomaraswamy yesterday promised to “give his absolute best shot” to restore the institution’s credibility, increase transparency in the bond market and stabilise macro-economic fundamentals to achieve growth in Sri Lanka. Giving his evaluation on Sri Lanka’s post-independence economic fortunes, Dr. Coomaraswamy noted that for the first time in 50 odd years Sri Lanka did not have a “drag” in terms of a conflict or regressive policies on its economy. As Sri Lanka is poised for a fresh leap of development, the new Central Bank Governor insisted it was the responsibility of his institution to provide the foundation for the country to leverage its geographical location and strong relations with other nations to attract investment to foster stronger growth. “Stabilisation has to be achieved in a sustainable way. If you look at our history over the last 30 or 40 years we start implementing programs but we never see them through. We have stop-go policies. The challenge right now is to put in place policies that give us sustained stabilisation. The world is a more uncertain place now and stabilisation programs mean pain but if we can get through the pain the prospects are out there,” he said. Dr. Coomaraswamy ruled out additional policy tightening as inflation, credit growth, interest rates and liquidity are at “acceptable levels”. Pointing out that changes were underway, the Governor stated effects of the previous Central Bank decisions would filter down over the next few months to maintain equilibrium in markets. He also dismissed inflation spikes from VAT increases as a “one-off” hit on inflation, referring to modest changes in core inflation as an indication of market stability. Exchange rate intervention will also be kept at a minimum. Officials also projected that inflation would moderate in the medium term and stay within the limits outlined in the IMF program. Sri Lanka is due for a review under the IMF program in November after an evaluation team visits Colombo in September. The Central Bank will look to the five-year development plan Prime Minister Ranil Wickremesinghe is expected to unveil during July for stronger indications of Government policy and structural changes that would affect policies, Dr. Coomaraswamy said, insisting that it would also give a broad outlook for private sector investment. The Megapolis project for Colombo along with massive urban development planned for Kandy and Trincomalee as well as dedicated investment zones would open up fresh space for investment, he added. Observing the shortage of Foreign Direct Investment inflows to Sri Lanka over the last seven years despite the end of the war, the newly-appointed Governor called on the private sector “recalibrate their risk appetite” and aggressively search for investment opportunities. He acknowledged that the failure of successive Governments to attract foreign investment was a sign that the macroeconomic fundamentals and governance aspects of the economy were not up to scratch but stressed this situation could be reversed. Brexit impact on Sri Lanka “will not be significant,” as less than 10% of exports head to the UK but other than a possible reduction in tourists Dr. Coomaraswamy recognised interest rates on commercial borrowings would mean the Government would have to be judicious on when it goes to the market. Financial sector consolidation will be allowed to happen organically as the overall sector remains stable. 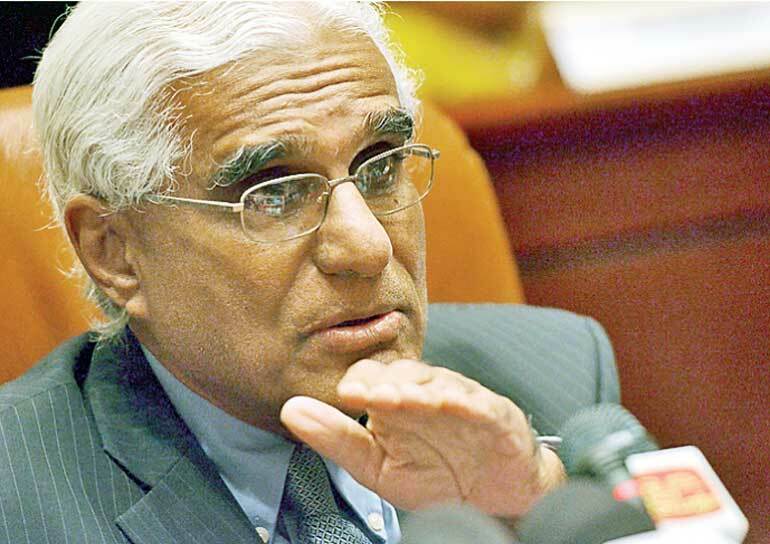 Central Bank Governor Dr. Indrajit Coomaraswamy yesterday ruled out launching an internal investigation into the controversial bond issue, but pledged to follow any recommendations put forward by the Committee on Public Enterprises (COPE). Dr. Coomaraswamy also emphasised the Central Bank would continue its efforts to increase transparency in the function of the bond markets and was already evaluating the systems of similar countries to adopt best practices. “The Central Bank will fully cooperate with the COPE inquiry. Whatever they want, we will respond. The inquiry will go ahead and they will draw their conclusions. Only after then can one think of what the next step should be,” he said responding to questions from the media. The new Governor plans to serve the full six years of his term and said he did not see himself as a political appointee. Dr. Coomaraswamy also explained his relationship with Raj Rajaratnam, a Sri Lankan-American former hedge fund manager and billionaire founder of hedge fund Galleon Group. He noted that the two had met briefly at the University of Sussex and subsequently Rajaratnam had reached out to Dr. Coomaraswamy to conduct macroeconomic research for his company. Central Bank Governor Dr. Indrajit Coomaraswamy yesterday explained his relationship with Raj Rajaratnam, a Sri Lankan-American former hedge fund manager and billionaire founder of the hedge fund Galleon Group. He noted that the two had met briefly at the University of Sussex and subsequently Rajaratnam had reached out to Dr. Coomaraswamy to conduct macroeconomic research for his company.